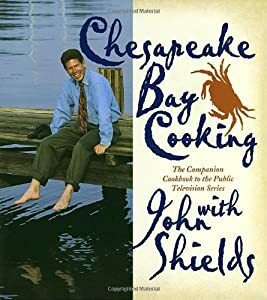 The series is really well done and actually takes John out of the kitchen and all around the Chesapeake Bay region to gather recipes from native people who have produced this cuisine and maintain its traditions to this day. Anyone interested in this style of cooking, the book and the show will be a valuable addition to your collection. Some of the dishes are more modern than the original or classic dish, but this just shows the evolution of the style of cooking and where it may soon be heading in the future. There are some great stories included in the series and in the book as well as interesting facts about modern influence on the dish. While the book is not all inclusive when it comes to Mid-Atlantic cuisine, it does a great job in giving a cross section of Chesapeake cooking and offers a fantastic variety of recipes for several dishes, including all of the usual classics and some less famous, but locally known dishes. This entry was posted in Cooking, history, review, Stories and tagged Allegheny Mountains, Atlantic, chesapeake, Chesapeake Bay, Chesapeake Bay Cooking, chesapeake bay region, classic dish, coastal cuisine, companion book, Cook, John Shield, John Shields, MId-atlantic, Mid-Atlantic states, Public Broadcasting Service, seafood recipes. Bookmark the permalink. I do love a good cookbook recommendation, especially one that focuses on regional cuisine. I’ll have to take a peek at his blog too. Thank you for sharing! Not heard of this author – sounds very interesting. The whole point of any book, fiction or non-fiction is to inspire. I hope you try some recipes out. Everyone is a cook, it’s just a matter of repetition, that’s why everyone’s Grandma is a good cook. Years of practice, no secrets to it. I have this cookbook, but it is still to new to know how much influence it will have over time, but it is a great cookbook to start with if you are interested in Mid-Atlantic Cooking.